Looking for a Sports Management Scholarship? Schools refer to the discipline as either sports management or sport management, and it can lead to a number of careers. Entry-level work includes marketing, community relations, and facilities operations on event days. Graduates with masters degrees can apply with confidence for the more advanced executive positions at sports franchises, college athletic programs, stadiums, or at firms involved in representing the athletes themselves or their corporate sponsors. 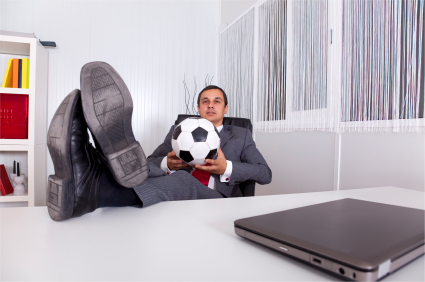 At the top of the employment structure, you find jobs like managing an NFL team, but whatever your professional goal may be a degree in sport/s management will strengthen your resume. Florida State University (FSU) offers degrees in sport management through its College of Education. The Jim Giroux Scholarship in Sport Management is reserved exclusively for this major, and it can go to either an undergraduate or a graduate student (degrees include bachelors through doctorate plus a joint juris doctor in sport management and law). If a suitable student from Leon County cannot be found, preference goes to a student from any part of Florida. The College of Education and Human Ecology (EHE) at Ohio State University, which offers a degree in sport management, provides links to different groups of its scholarship applications rather than text summaries of individual awards. The links to various application forms (for new or current students, for scholarships at certain campuses, for graduate students and undergraduates) are only available during the period during which applications are solicited. However, EHE does provide detailed checklists of information that students will be asked to provide on various types of scholarship applications. For example, there is one set of data that will be requested from undergraduate transfer students, a second set from incoming undergraduates, and a third from current Ohio State graduate students. That means you can apply for an entire set of scholarships by submitting one application, which is convenient. The Marie A. Fitzgerald Scholarship does not specify a major within HPLS. The Professor Neill Miller Scholarship is reserved for undergraduates who have surmounted academic obstacles to succeed in school. Students who also have financial need receive preference. The Sport & Leisure Sciences and the Coca-Cola Scholarships also assist financially needy students, both undergraduates and graduate students. The Dr. Patricia K. Fehl Graduate Student Scholarship lists sport management as one of the subjects eligible for the award. The Eleanor Lantz Scholarship looks for a recipient with both an excellent academic record and financial need. The Fred M. Coombs Scholarship also specifies financial need, but its GPA requirement is 2.8. The Sport Management Scholarship goes to a student with a cumulative GPA of 3.2. Columbia College Chicago sponsors one scholarship especially for its Sports Management students, the Make a Dent Scholarship. Applicants should demonstrate either scholastic or athletic achievement as well as financial need. Your GPA should be at least 3.0, and you must file a Free Application for Federal Student Aid (FAFSA). Incoming and current students are both eligible for Make a Dent. The Joan E. Barr Memorial Scholarship benefits financially needy undergraduates with strong scholastic records. Participation in extracurricular activities is required. The Garret and Jessica Bedrin Scholarship is for an undergraduate who belongs to a minority and has a good academic history. Financial need is a necessity. The Erik K. M. Kjeldsen Leadership Scholarship, in addition to the usual criteria of financial need and superior achievement in school, looks for a natural leader, a student already involved in an outside project. UMass Amherst also provides an internship track as part of its sport management program, which qualifies a student for certain scholarships designed for interns only. Examples are the Gloria Nevarez Internship Scholarship for minorities, the McCormack Sport Management Alumni Internship Scholarship for full-time interns, and the Kristian J. Rose, Jr. Memorial Internship Scholarship for a student dedicated to public service. North Carolina State University’s Department of Parks, Recreation and Tourism Management sponsors the Jack “Swede” Frauson Sports Management Scholarship for majors in the field. The Frauson award is for current undergraduates, and it is named after a former recreation consultant for the state, whose personal contacts attracted donations.